Illegal mud-bogging in Krause Basin! Please take 5 minutes today to urge the Flathead Forest Supervisor to select the Forest Plan option that removes motor vehicles from Krause Basin! "Another option to resolve objectors’ concerns over unauthorized motor vehicle use and address their desire for the area to be non-motorized would be to remove the desired condition for existing trails to provide summer wheeled motorized trail experience and motorized winter recreation opportunities close to local communities. A suitability plan component could be added indicating the area is not suitable for motor vehicle use." You don't need to have filed an Objection to send this email to Supervisor Chip Weber. Every message helps! Click here to read our short letter to the Forest Supervisor and District Ranger in this regard. Click here for more information on the Krause Basin issue. Click here for the 121-page Response to Objections. The Krause Basin discussion is on page 19. This is our last chance to get motors removed from Krause Basin in the revised Forest Plan! THANK YOU for taking 5 minutes to help make it happen! 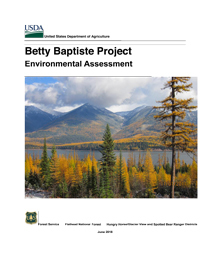 The Flathead National Forest has invited comments on its Betty Baptiste Project Environmental Assessment, which covers the Logan Dry Park grizzly bear management subunit. Alternative 4 in the EA would at long last close enough of the old logging roads to provide the level of grizzly bear security required by the Forest Plan since 1995! It is tied, however, to a timber sale that industry is not likely to even bid on because of poor economic conditions. a) Drop the logging/timber sale portions of Alt. 4 and independently fund the road closure work to benefit fish and wildlife. Even if the timber sale is purchased by industry, the EA shows it will build more roads to haul away habitat and further spread noxious weeds - while not raising enough money to pay for the ecosystem restoration work! b) Fully decommission and revegetate, not just "store," the roads necessary to reduce Total Road Density and meet Forest Plan standards. 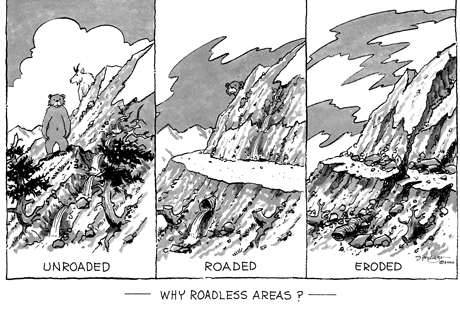 You can't reduce road density by leaving those roads on the landscape! Click here to read Swan View Coalition's comment letter. Click here if you wish to look into more details on the Betty Baptiste Project. GOOD NEWS: We've been awarded another $4,000 matching grant from Cinnabar Foundation, so DONATE NOW to support our work and have your donation doubled by Cinnabar! THANK YOU for supporting our work with your emails, letters and donations! 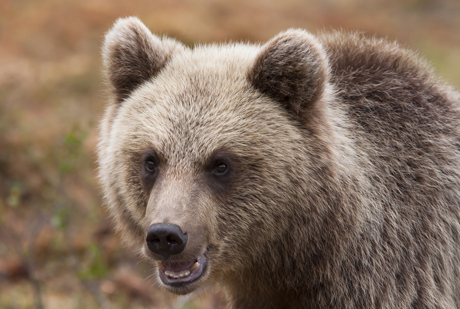 The plan revision and amendments are intended to pave the way for delisting of threatened grizzly bear in the NCDE, which would remove their Endangered Species Act protection. The groups launched a letter writing campaign in 2016. This resulted in 98% of the 33,744 comments the Forest Service received on its Draft Environmental Impact Statement calling for protection of all remaining roadless lands as wilderness and continuation of the road decommissioning program that agencies credit with improving grizzly bear security and helping restore critical bull trout watersheds. 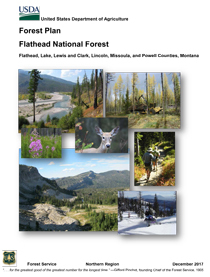 The revised Flathead Forest Plan instead abandons its road decommissioning program and recommends for wilderness designation only 30% of the areas it found suitable for wilderness. The Kootenai, Lolo, Lewis and Clark, and Helena Forest Plans would similarly be amended to abandon road removal as a primary means to restore fish and wildlife habitat that has been damaged. The groups rallied around the principles of the Citizen reVision alternative Swan View Coalition and Friends of the Wild Swan asked the Forest Service to include in its DEIS. The DEIS included some of these principles in its Alternative C, which it then assigned the highest marks for maintaining water quality and wildlife habitat connectivity. The FEIS and revised Flathead Forest Plan, however, select Alternative B-modified even though it is assigned "the highest risk of impact to aquatic species" and "is likely to adversely affect" already threatened grizzly bear, bull trout, and Canada lynx! The Objections were due at Forest Service Region One headquarters in Missoula on February 12. The Region now has ten days to "publish a notice of all objections in the applicable newspaper of record and post the notice online." The Region's responses to the Objections are due within 90 days, unless it grants itself extensions. Swan View Coalition Objection and Supplemental Objection. Friends of the Wild Swan Objection. Independent Wildlife Consultant Brian Peck Objection. WildEarth Guardians, Western Watersheds Project and Sierra Club Objection. Alliance for the Wild Rockies, Montana Ecosystems Defense Council, Friends of the Wild Swan Objection. Flathead-Lolo-Bitterroot Citizen Task Force, Wilderness Watch, WildWest Institute, Friends of the Bitterroot, Friends of the Rattlesnake, Friends of the Clearwater, Independent Consultant Mike Bader Objection. Citizens' Objection filed by WildEarth Guardians on behalf of 4,000+ signors. Montana Chapter Sierra Club Objection. Click here for a Missoulian article on the 74 Objections filed. Click here for Montana Public Radio coverage of the 74 Objections filed. 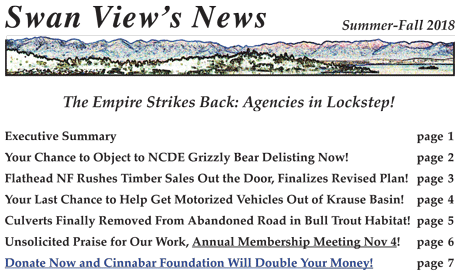 Click here for a Missoula Independent article on Objections filed. 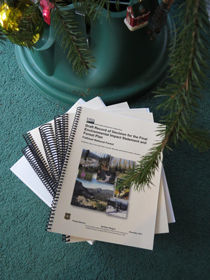 The 3,000 pages of FEIS, Forest Plan and Forest Plan amendments can be found here. If you commented, signed our petition or form letter in 2015 or 2016 on the draft Flathead Forest Plan in favor of more Wilderness and a non-motorized Krause Basin, you have until February 12 to express your disappointment with the final Forest Plan and ask for changes! This alert will make it easy for you. 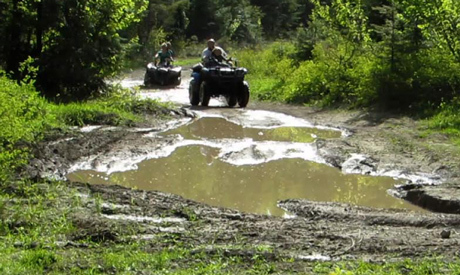 The final Plan would designate and promote Krause Basin as a Focused Recreation Area and mark the old system of ATV trails on-the-ground, in violation of past promises to instead ban motorized use of the old trail system. While the final Plan recommends a bit more wilderness than the draft (0.4% more) it shrinks the size of the Jewel Basin proposed wilderness by 3,500 acres to allow mountain bikes. It also blasts a biking corridor smack through the middle of its meager Bunker Creek proposed addition to the Bob Marshall Wilderness. Thanks to folks like you, 98% of the 34,000 public comments the Flathead received asked for all roadless lands to be recommended for Wilderness and for the continued implementation of Forest Plan Amendment 19, which would remove 520 miles of road and close more trails to motorized use, including in Krause Basin, to provide better security for wildlife. It is important you take a few minutes to file an Objection because it is obvious the Flathead is swayed by industrial-strength logging and industrial-strength "wreckreation." Only 30% of wilderness-suitable lands are recommended for Wilderness. Forest Plan standards to reduce logging roads and motorized trails in order to protect fish, wildlife and quiet recreation are abandoned! Click here and/or scroll down for more information and step-by-step instructions on how to find your comments and file your Objection! The Flathead National Forest dumped 3,000 pages of documents on the public over the holidays and Fish and Wildlife Service piled more on - all intended to strip Endangered Species Act and other protections from Glacier- and Yellowstone-area grizzly bears! So we are under federal deadlines in January and February to file formal objections to the revised Flathead Forest Plan (pictured at right), other Forest Plan amendments and FWS's delisting efforts. Please DONATE NOW to support our work. We are working overtime and have contracted a wildlife consultant to help! Click here for a Missoulian article about the "Document Dump" and various deadlines for public involvement. We'll send out an alert in early January about how you can be involved. 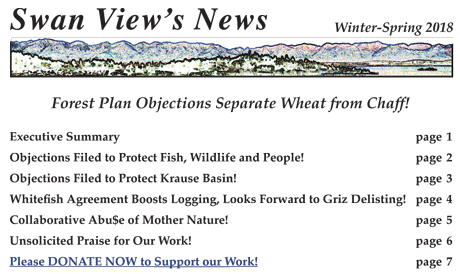 Meanwhile, you can visit the Flathead Forest Planning web page to learn more about the planning documents and the Objection process. Thank you for your support in 2017 and don't forget to have a HAPPY NEW YEAR!